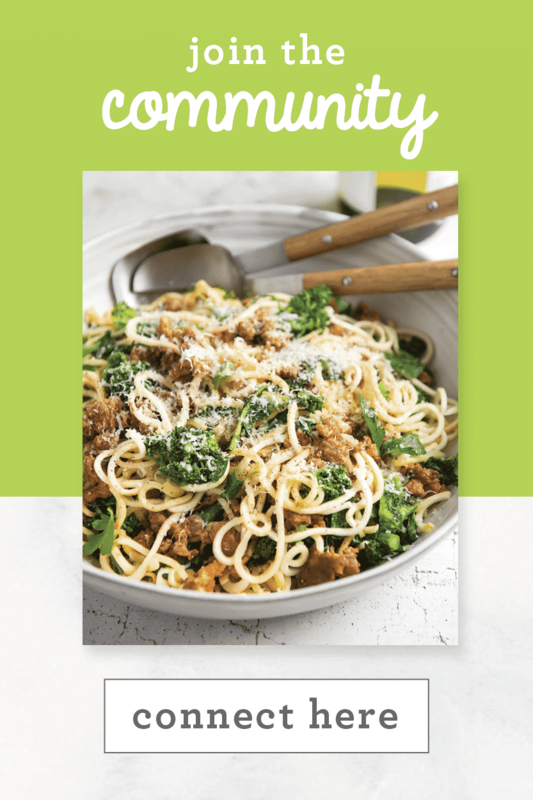 With this, I’ve lightened up some classic Italian favorites using the spiralizer! 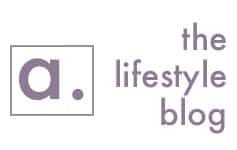 Also, some amazing bloggers and I will be hosting a virtual dinner party, starting on April 6th – so mark your calendars! 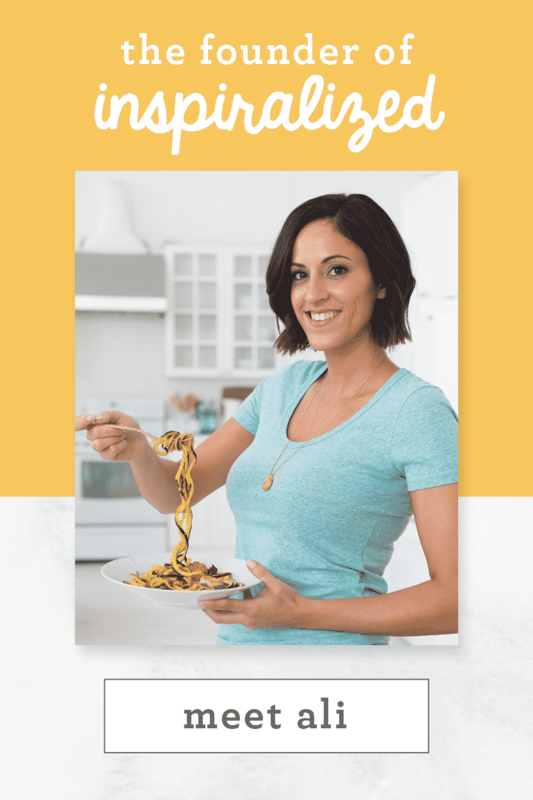 The virtual dinner party will feature new bloggers each day, bringing you a new spiralized course! 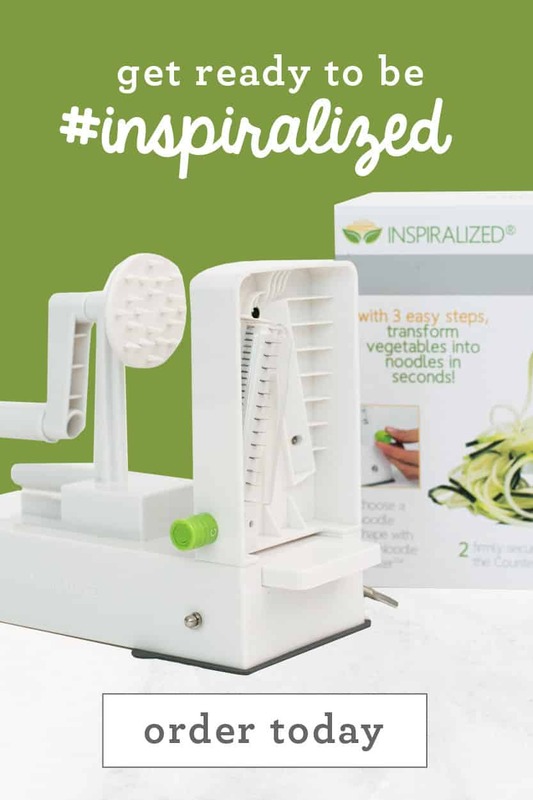 Most importantly, Tuttorosso Tomatoes will be offering some Inspiralized giveaways (including the Inspiralizer! ), as part of this spring campaign, running through April 15th! “Inspiralize the Spring” officially kicks off today! What can you win and how do you enter? Find out all the official details here, on Tuttorosso’s Facebook page. 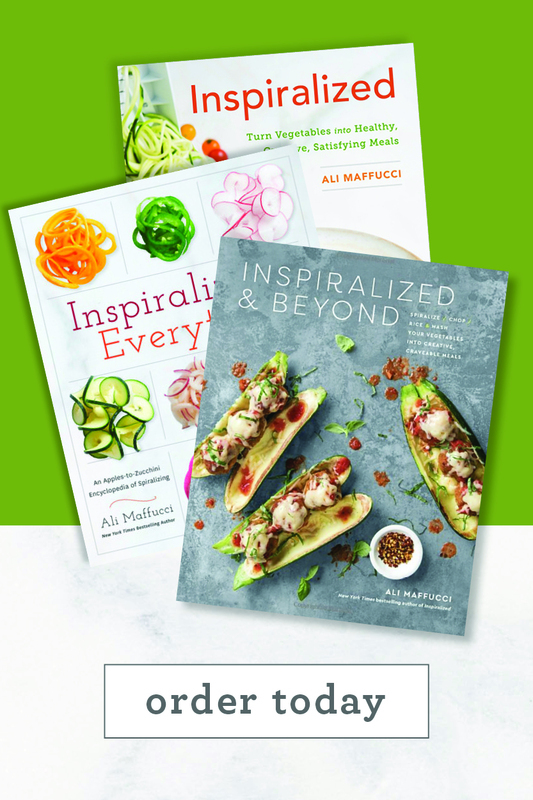 There, you can enter for your chance to win 1 of 750 Tuttorosso aprons, a chance to win 1 of 15 copies of the Inspiralized cookbook, or a chance to win 1 of 60 of The Inspiralizers! One lucky winner will be awarded the Grand Prize worth about $500 which includes a Tuttorosso deluxe picnic basket, the Inspiralizer, the Inspiralized cookbook, and kitchen gadgets personally selected by yours truly! I’m so proud to be collaborating with Tuttorosso Tomatoes – I’ve been watching my grandparents cook with their canned tomatoes for, well, ever! A few months ago, I actually went to a Tuttorosso event in NYC and they emptied out a few of the competitor’s tomatoes into bins for us to taste and I was absolutely shocked at what I found: some of the competing products’ tomatoes either were unripe, bruised, broken or simply tasted terrible, when compared to Tuttorosso! Also, while Tuttorosso’s tomatoes come in a can and not a glass jar, rest assured – they informed me that BPA in enamel liners does not leach out due to acidity. Leaching is actually a result of excessive heat. In order to verify this, they tested their tomato products. Using three different independent certified laboratories, Tuttorosso’s canned tomato products have been tested at various periods of their 30 month shelf life to determine the amount of BPA in the product. With the containers that they are currently using, largely due to Tuttorosso’s proprietary canning process, their tomato products are indicating no detectable levels of BPA in the finished goods, even at the 30 month ‘best by date’. 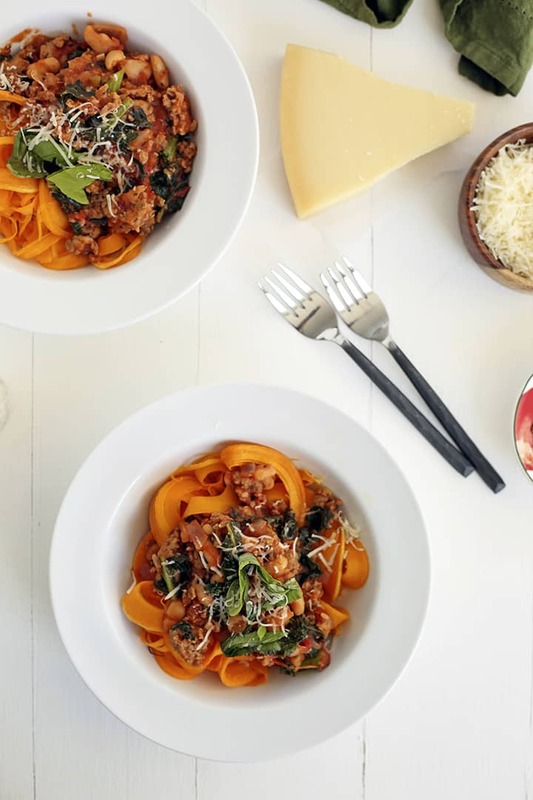 Today, I’m Inspiralizing the Spring with this recipe for my Tuscan Kale and Sausage Ragu with Butternut Squash Fettuccine. This dish is a healthy, flavorful way of enjoying the last of those winter squashes, before we launch fully into spring and summer! If you’d like to make a big batch and freeze this dish, you can! Spiralize the butternut squash and put it in an airtight container in the refrigerator and then prepare the ragu and store that separately. 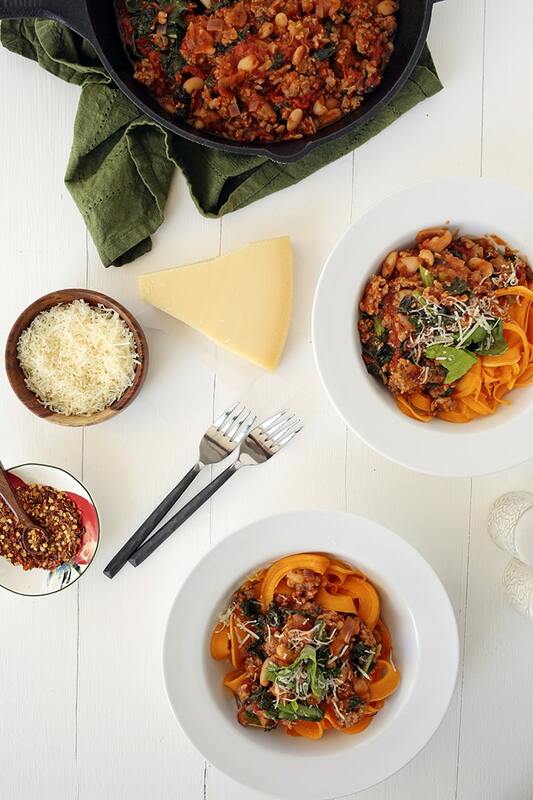 When you’re ready to eat, just reheat the ragu over the stovetop and bake the butternut squash noodles according to the recipe! Note: While Tuttorosso Tomatoes sponsored this campaign, all opinions are my own, as always. Do you currently use Tuttorosso Tomatoes? Do you have a favorite canned tomato? Place a large pot over medium heat and add in the sausage. Crumble the sausage further with a wooden spoon and cook until browned, about 10 minutes. Then, add in the onions, garlic and red pepper flakes and let cook for 2-3 minutes or until onions turn translucent. Using your hands, crush the tomatoes over the pot. Using a wooden spoon, further crush the tomatoes so that no large chunks remain. Then, add in the tomato paste, wine (or broth), basil, oregano, bay leaf and season with salt and pepper. Raise the heat to medium-high and bring to a boil and then reduce heat to medium-low to a simmer. Cook for 30-35 minutes or until reduced by half and then stir in the kale and beans. Cook for another 5 minutes or until kale wilts and sauce is thick like a ragu. Peel and spiralize the butternut squash, using Blade B. Line a baking sheet with parchment paper and lay out the butternut squash noodles. Drizzle with olive oil and massage it into the squash with your hands. Once you add the kale to the ragu, season with salt and pepper and roast for 8-10 minutes or until cooked to al dente. 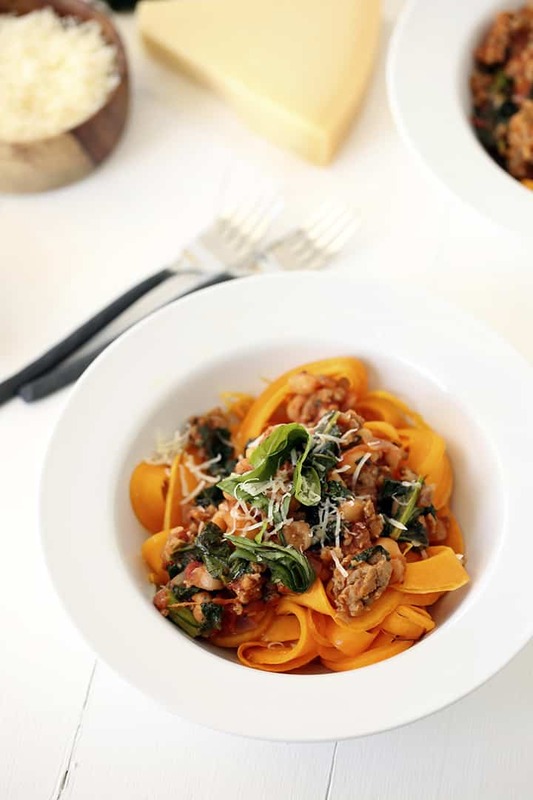 Divide the butternut squash noodles into bowls and top with the ragu, making sure to discard the bay leaf. Garnish with basil and Parmesan cheese. I will be making this exceedingly promptly. Thanks for another delicious recipe, girl! This looks so delicious I can't wait to try it! Do you know if Tuttorosso tomatoes are organic and non GMO? Tuttorosso Tomatoes are non GMO as well as now being packed in Non BPA lined cans! Hello Ali!!! 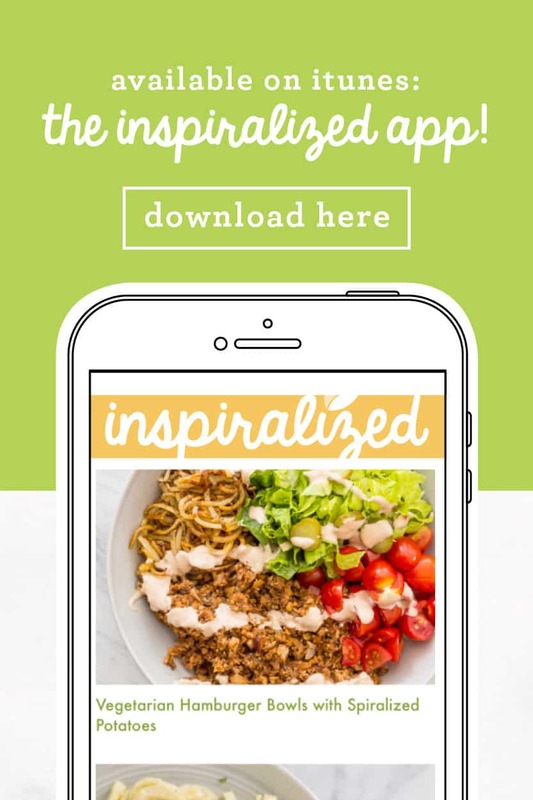 I have my Inspiralizer and T-Shirt on pre-order, bought the cookbook on Amazon with my Kindle App!!! I'm a fellow Jersey Girl, and am in your corner!!!! So happy for all your success. I had one question about this recipe--when do you bake the butternut squash noodles in the oven on 400?--is that why they're in the baking dish after covering with oil?--Is that what is roasting for 8-10 minutes until al dente? I just discovered butternut squash this fall, and am eager to find more uses for it!!! I too would like to know what the heck you do with the butternut squash in this recipe. I wonder if the recipe got muddled up when being posted, seeing as each line, rather than each item, is numbered? Confusing! Yes, it looks like the line numbers are on every line but this is my interpretation of the recipe concerning the butternut squash. 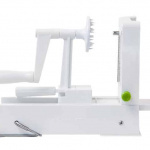 The butternut squash is made into linguine noodles using the B blade, then massaged with oil. Then wait until you add the kale to the sauce and then put the butternut squash in the oven for 8-10 minutes or until al dente. This has been fixed, sorry for the inconvenience! can you make with ground turkey instead? Presumably you could sub the sausage meat for anything you liked, the only limit is your imagination and skills at matching flavour. Turkey is very bland compared to spicy Italian pork sausage but at least it would take up the flavors of the sauce. Ali, what do we do with the butternut squash? Roast it? Any idea how long for? Hay-elp! Will we be receiving a corrected recipe via email? The recipe is accurate on this page! It still doesn't really say accurately what to do with the butternut squash. 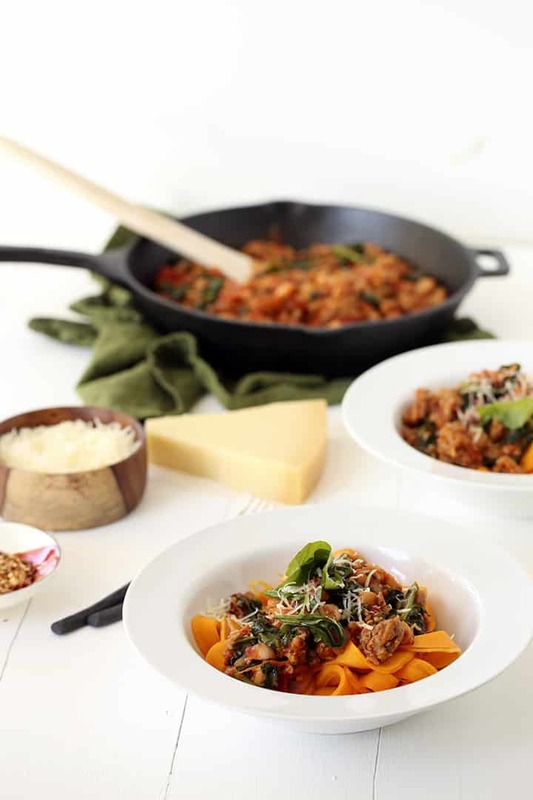 Maybe "add the tuscan kale to the ragu" should be its own line, or it should say "season squash with salt and pepper...." I mean, I know that I personally am NOT going to eat raw butternut squash (yikes) but I had to read it and read all the comments to understand that it is to be roasted! ;) Can't wait to try this tonight! Alyssa - it says explicitly to spiralize and roast the butternut squash, in the recipe! Oh my yum! I want to make this with turkey sausage! I watched the video and didn't even follow the instructions past the sauce. :) Great recipe. Ali - I made this recipe last night and it was sooooo delicious. My husband actually said these words, "This is freakin' award winningly good". lol...I do not get comments on my cooking like that very often, so he must have enjoyed it thoroughly. Thank you for the video on how to spiralize the butternut squash. 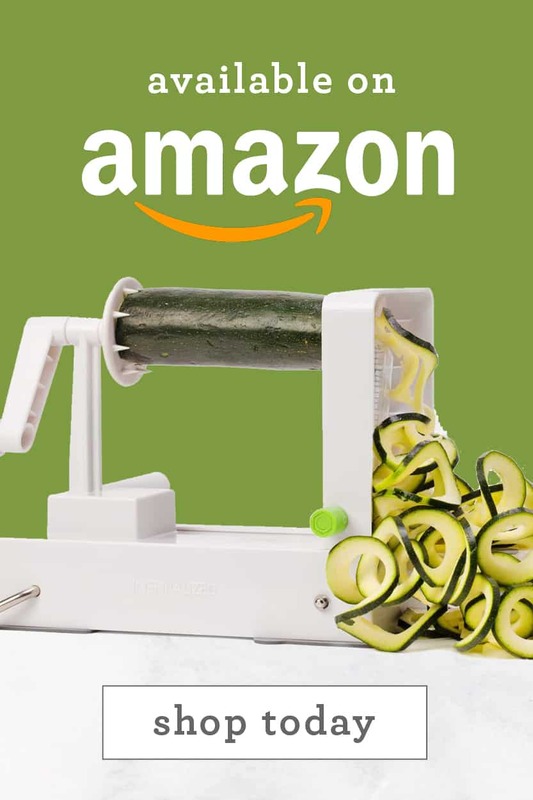 I had only done zuchinni and summer squash in the past ( I am unable to get some of the veggies you spiralize), but now I can add this to my list. I also went out to tuttorosatomatoes.com and grabbed another spiralized recipe (Al Fresco Zucchini Pasta Salad) and made that for lunch today. It's a cold salad to serve as a side dish. It was to-die-for good. Love your website. Keep up the good work. This recipe was amazing! My whole family loved it. Thank you for coming up with such varied and creative ways to use the spiralizer. I look forward to seeing your posts every day! Yummy! Yummy! Great recipe! I have pictures but not sure where to post them. This was my first spiralizer recipe. Any suggestions on what to do with the cut off end of the butternut squash? Delicious! Adapted it a bit due to forgetting to get some ingredients but that's the fun of cooking! I'm trying lots of new vegetables due to your recipes, Ali! I made this recipe and it was delicious! I have a 4 blade Paderno Spiralizer and couldn't figure out how to make my butternut squash look like fettuccine. What is the trick to this? Also, bought your cookbook and love it! You have to have the Inspiralizer to do that! But you can just use a thicker spaghetti blade on the Paderno for a somewhat similar effect! Just curious. Can I just drop the butternut squash noodles in boiling water or are they better roasted? Just asking as I have (hopefully!) enough noodles for 6 of us and I might have to use to sheet pans! I made this sauce in the slow cooker today, so I can't wait for dinner!! Hi June! These veggie noodles are usually better/hold up better roasted or pan sauteed!